Dr. Smith is a Physician Leader with over 20 years of experience in health delivery systems with a background in performance measurement, health policy and interdisciplinary teams caring for populations of patients with orthopedic conditions. Dr. Smith graduated from Queen's University Medical School in Kingston, Ontario, Canada in 1995. After completing a residency in Physical Medicine & Rehabilitation (PM & R) at Stanford University, Dr. Smith worked for three years in Occupational Medicine at Kaiser Vallejo Medical Center in California. During this time, Dr. Smith became a diplomate in Electrodiagnostic Medicine, completed the UCLA Acupuncture for Physicians Course and completed training in Osteopathic Medicine. In July of 2002, Dr. Smith returned to school at the University of Michigan to complete a fellowship in Spine and Sport Medicine. He is certified by the American Board of Independent Medical Examiners. In 2016, Dr. Smith graduated from the Executive Master of Healthcare Leadership program at Brown University, further developing his skills as a physician leader. 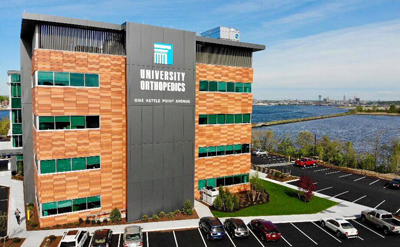 Prior to joining University Orthopedics, Dr. Smith established East Greenwich Spine & Sport (EGSS) in 2003. Dr. Smith was the founding President of the Rhode Island Pain Society, and Division Chief of PM & R at Kent Hospital. He is also an active member of the Value Committee, Performance Measurement Committee and Payor Policy Review Committee of the North American Spine Society. Clinical services Dr. Smith provides include the diagnosis and non-surgical management of acute and chronic neuromusculoskeletal disorders, such as acute and repetitive injuries to the spine and extremities. He performs fluoroscopically guided back and neck injections including various epidural steroid injections, intraarticular joint injections, and radiofrequency neurotomy ablations to facet joints and the sacroiliac joint. Pressure-controlled, CT discography can be used for the evaluation of discogenic low back pain. Patients will benefit from Dr. Smith's background in rehabilitation, Osteopathy and electrodiagnostics as they are triaged to therapy, diagnostic/therapeutic injections or surgery. Dr. Smith also offers consultative services as a regional expert in value-based healthcare reform and medicolegal issues involving disability or impairment of the neurological and orthopedic systems. Independent Medical Evaluations can be arranged through direct contact from legal representatives. Outside of work, Dr. Smith enjoys spending time with his family, teaching Tai Chi Chuan, sailing and skiing. Smith MJ. The value of shared decision-making. SpineLine. www.spineline-digital.org. 2016; July-August: 20-23. Smith MJ. Content analysis of CMS Healthcare Innovation Awards from a physiatric perspective. PM & R : the journal of injury, function, and rehabilitation. 2014;6:1048-53. Smith MJ. Impairment and Disability Issues. In: Sepe SM, ed. Ferri's Clinical Advisor. Philadelphia, PA: Elsevier Mosby; 2015:1709-10. Smith MJ, Standaert CJ. Towards an expanded definition of value. The Spine Journal. 2013; 13:1690-1697. Smith MJ, Congleton SA. The role of non-physician providers in the delivery of high value spine care. SpineLine. www.spineline-digi- tal.org. 2013; July-August: 20-25. Smith MJ. Accountable disease management of spine pain. The Spine Journal, 2011; 11: 807-815. Quoted in: The Back Letter. Growing Furor Over Epidural Steroid Injections--And the Lack of Evidence Supporting Them. November 2015;30:121-30. Smith MJ, Tong HC. Manual acupuncture for analgesia during electromyography: a pilot study. Archives of Physical Medicine and Rehabilitation. 2005; 86(9): 1741-44. Smith MJ, Matheson GO, Meeuwisse W. Injuries in cross-country skiing: a critical appraisal of the literature. Sports Medicine, 1996 Mar, 21(3): 239-50.
calling the office to see if I can have a second opinion from another doctor without having to pay my co‐pay again because I'm not happy. patience and I felt like a 'number'. I waited a long time for this appointment and I'm not happy. issues I am dealing with. thankful for his whole team....including Julia and Ilda. Dr. Smith has excellent people skills ‐ he listens well and asks questions while he is putting you at ease. I liked his professionalism, manner and thoroughness. I would highly recommend Dr. Smith to anyone. that someone whould spend many years in school and lie. I whould like others to review his negative comments. Dr. Smith was so kind and professional during my visit. I told him about a problem I was facing and he was so understanding and helpful. I will recommend anyone who needs this type of injection to Dr Smith. Orthopedics because I had a good experience with him previously.